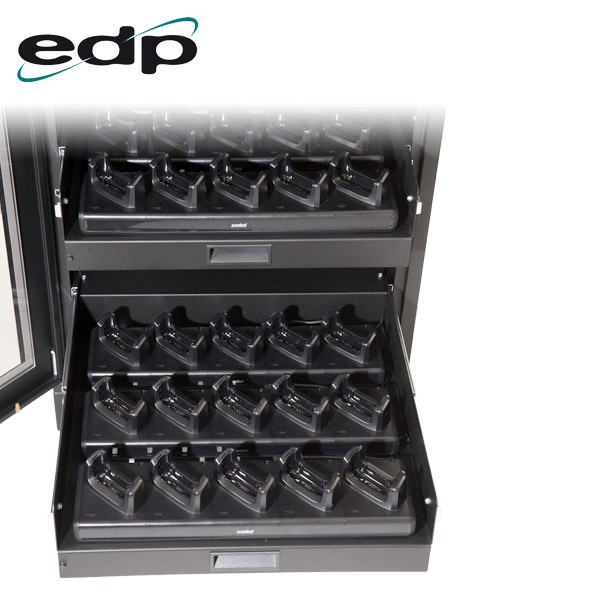 EDP Europe’s latest charging rack is the High Density Device Dock HD3 and is capable of securely charging multiple hand held portable devices concurrently. Available in a range of sizes to enable varying capacities, it provides a cost-effective modular solution for charging mobile devices that are widely used in the logistics and distribution sectors. 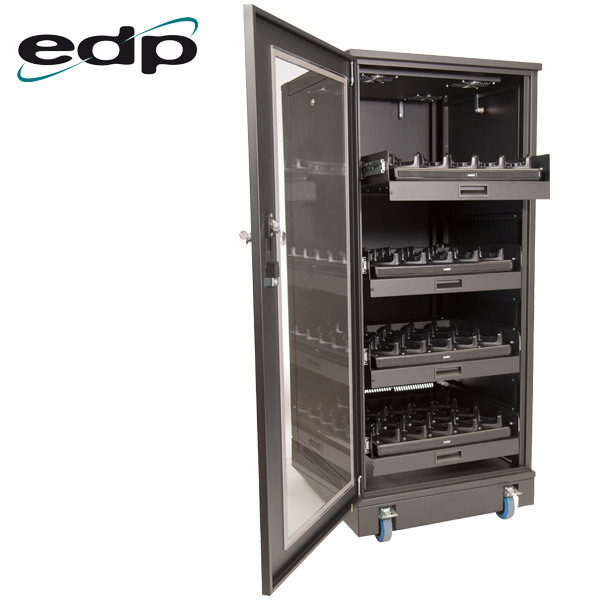 The High Density Device Dock HD3 charging rack from EDP Europe is a charging cabinet that has been designed to help users of mobile equipment centrally manage, charge and secure their high value portable assets. In Today’s data driven society, the use of portable mobile devices is increasing particularly in the logistics and distribution sectors. With so many devices being used, ensuring efficient management is vital to business continuity. The High Density Device Dock HD3 provides a cost-effective solution to multiple handheld device charging, by enabling it to be centrally managed through a specially designed charging cabinet. 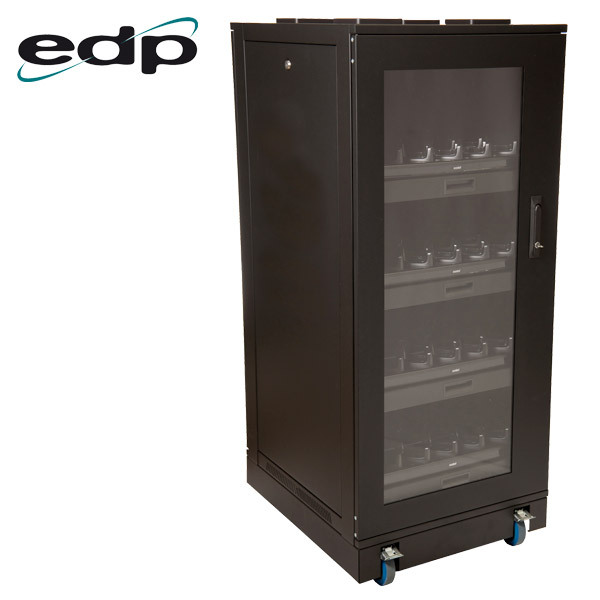 These charging racks are supplied with user specified charging units fitted and wired for use with all popular makes of hand held devices, including the Zebra TC55 and TC56. The High Density Device Dock HD3 has a fully welded construction for maximum strength and durability. Its flexible design enables this charging rack to be customised to suit a wide variety of portable devices and their associated charging cradles. The racks are fitted with a quick release door swing handle with options for enhanced security. Side and rear panels are lockable but removable for easier access during maintenance schedules. A rear mounted power supply bar provides better power cable management, while the PSUs for the charging cradles are consolidated and secured within the chassis at the rear of the cabinet. 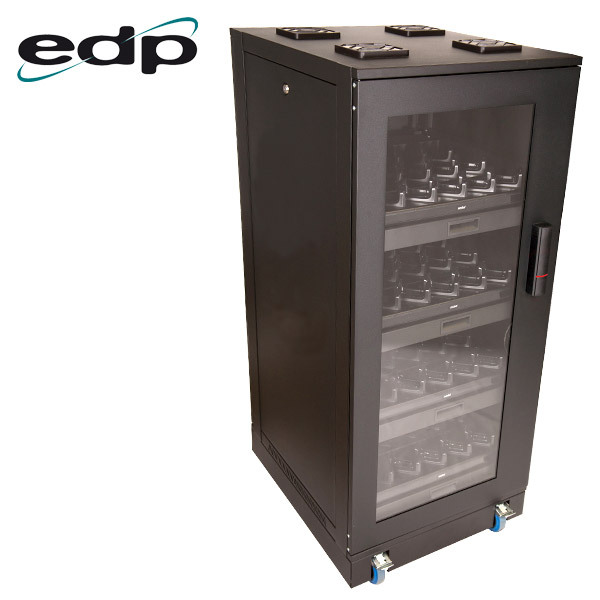 Integral LED lighting enables increased visibility, while telescopic vented drawers help increase airflow within the rack. Custom colour finishes and branding options are available enabling these charging racks to match any corporate branding requirements. Security can be enhanced with the addition of a smart locking system capable of controlling who has access to the stored devices, when, and for how long. This enables alignment with loss prevention strategies, and provides an audit trail of ‘sign in’ / ‘sign out’ activity. This enhanced security option can be retro-fitted or ordered pre-installed, with access being managed remotely or via swipe, pin or biometric readers locally. The access control system can be used as a standalone system or can be centrally managed across multiple locations. Quick release door swing handle with options for enhanced security. Removable rear panel for access with internal lock. Removable side panel with cam lock & key. Vertical cable containment tray fitted inside at the rear. Rear mounted power bar for better power cable management. PSUs consolidated and secured within chassis at rear of shelves. Telescopic vented drawers with dividers for increased airflow. Anti roll-back shelf design for ease of use. 4 x Fans fitted in roof to extract warm air. Integral LED light strip for increased visibility. Plinth surround with counter balance weight to prevent tipping. 2 x Recessed locking & non-locking heavy duty castors to remove trip hazard. 240V 16A IEC C19 connector to allow worldwide compatibility. Inset mains connector to rear allows cabinet to sit flush to wall. Locking mains lead to prevent accidental removal. Fully customisable to suit a range of devices and associated charging cradles. Custom colour finishes and branding available. Cost effective and available from stock or against short lead time. Control who has access to devices, when, and for how long. Align with loss prevention strategies. Provides audit trail of ‘sign in’ ‘sign out’ activity. Can be retro-fitted or installed up front. Manage access to devices remotely or via swipe, pin or biometric readers locally. Available as standalone or can be centrally managed across multiple locations. In-dock device tracking system under development for release in 2019.